Join us for a Winter Holiday Event which will be hosted at the home of Joe Mure and his family to benefit JDRF. Enjoy an afternoon filled with Special Entertainment, Food and Toys for all. Dress festive and bring your holiday cheer! Or please support our fundraiser by making a donation today. Living with T1D means there are no days off and there is no cure. But there is hope. Your generosity will help JDRF fund life-changing breakthroughs to remove the incredible daily burden of this disease—such as the work being done on the close loop system (or Artificial Pancreas). In people with T1D, the body often defies even the most vigilant efforts to keep blood-sugar levels normal. Artificial pancreas systems, however, take over much of the blood-sugar management. They monitor blood-glucose levels with a continuous glucose monitor (CGM) and use an algorithm to automatically provide the right amount of insulin at the right time—much like a normal pancreas would do naturally. 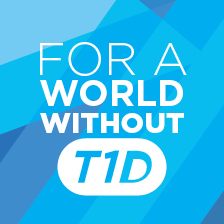 These advances allow those living with T1D and their families a better quality of life until a cure is found.